What do the LibDems do now? After the worst electoral defeat in living memory, we need to be sure why we exist. And where we’re going. It isn’t enough just be “not like the others”. We need to reclaim what makes the Liberal Democrats distinctive, differentiated – truly liberal. We are not pale imitations of this party or that. We are the guardians of British Liberalism, and we cannot – will not – let it wither and die. We exist to protect those without power. We exist to give them a voice. We exist to ensure that Government serves them, not the other way round. We do not hunt for some mythical place called the centre ground, we search for a place where there is justice, and compassion, and where the great talents of the people are liberated for the greater good of the community. We do not seek to rule our people, we seek to give them the tools, the knowledge and the support so that they may rule themselves. Remember: the future starts today. The future is what we make of it. 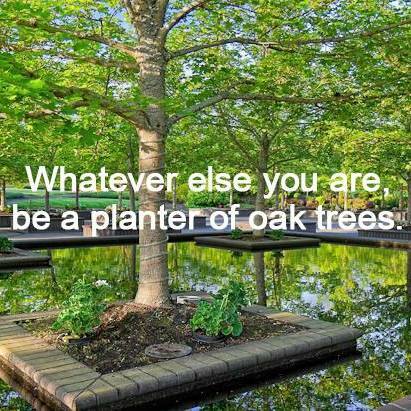 Be a planter of oak trees. What policies would very liberal people support ?